I’m one of those who were originally unwilling to watch this drama because of its apparent “odd casting”, but I’m glad a friend convinced me to watch it. I’m enjoying every bit of the story writing, brought to life by very talented actors, both lead and supporting. The only part of the script that came across as somewhat forced was the bit in Cuba where Samuel asked Jin Hyuk if he loved his CEO. I didn’t think it was possible to infer that from the letter and the brief encounters Jingyun had with Samuel. Otherwise, everything has been nicely paced so far. Together with “Empress’s Dignity”, it does feel like the season’s dramas are discussing the issue of maternal influence on a child’s development into adulthood. Both CSH and JWS have very self-serving mothers, yet the outcome of both are so different. Mr Nam also reminds CSH’s father that she had always had a bright and spirited personality, not easily taken down or defeated. JWS on the other hand is said to be his mother’s son. So in the nature vs nurture debate, nature trumps all? What then of chance and serendipity? I think it’s because Samuel knows that JH is a merely employee but what makes him come all the way to Cuba just to persuade Samuel. The only explanation and conclusion Samuel had in mind is JH must be in love with the CEO in order to go to that extend. I think this was also explained by some users in this thread. If you have time to go back to those pages, you can find the answer. I’m obviously in love with this couple. I love how she finally told him that she loves him and I also love how he already knew that because even though she hasn’t been putting her heart in her sleeve like he has, she’s been showing how much she depends on him. I truly believe that SH and his parents can become good friends. I loved the conversation between JH’s appa and SH because there was a deep mutual respect. In this scene, SH held her own by confortably also asking the dad to root for them. I can’t wait for the family dinner, I’m not too sure about mum but as others have stated, she’s a really nice person, she’ll come around. The only one problem I had was the sacrificing without telling the other person. Don’t get me wrong, I understood why JH lied but I really wish they had spoken about it and he had given her the go ahead instead. If SH has actually gone to the memorial, she would have been in the news headlines and the family might have found out about it anyway, which might have affected their impression of her. I didn’t really like that he would put her in that position even for her sake without telling her. "The players in the ring have it the hardest. It's nothing for the onlookers." Jh appaa! Thank you for understanding, thank you for confidently even suggesting the dinner with "JH's Ceo" later! We have great male examples in him, Driver Nam, and even SH' dad, I want more female mentor-ship, till now I've only noticed teacher Lee. "Soohyun-shi. Why do you like me?" JH must have been called ordinary so many times this series- by Woosuck, Sh's mom, Sec Jang and even by himself "it must be tough for you since I'm ordinary" - during the breakup call when their relationship got revealed in press or wondering whether the ring he got her was enough last episode. Whenever it has happened he has just taken it, but his face always showed his turmoil and this ep he finally sought out Sh. He really needed to hear it from her to absolve his doubts. "It'll happen to us one day right?" "I had to control myself last time" - Chinguuus, they might not have parked at boom boom town but they were nearby. He was so sleepy at the airport too last ep. And SH's answer-"I pictured it in my head, and it seems nice." "He's a human stimulant"
"Soo hyun has always had guts. She's just finally being herself again." "The presidential election is important, but my child comes first." So good to see Driver Nam tell it straight! And also admirable is Sh's dad willing to part with the election race because like an actual parent he cares about his daughter and is trying to make a mends. Contrast: Mrs Bampodong calls her literally panicking and weeping to attend the funeral meet. To sell her dignity for them like always. That utter desperation - it disgusted me. SH's repeated yearnings for a mother figure and affection hit me even more than before. "Deliberately hurting someone you love, is that right?" "My wealth or power doesn't match yours. I'm an average 30 Yr old man. I will protect her in my own way." Jin hyuk owns up, makes it clear love is being considerate about the other person, and the ex is in an unhealthy self servicing obsession. Also including the scene later with WS and his mom, I hope some parts of this convo with JH register in his head later. He seems terrified of his mother but he's also observing her ruthless bullying maybe finally with new eyes? Maybe he can finally realise how his actions looked to JH. Is it too much to hope for him to turn his back on Taegyong aswell? Him and SH were birds in the same cage, this is their chance to get free. This episode just made me hopeful for everyone. SH: "Your feelings for me are what heal me. If I didn't have you by my side, I would've been scared and lonely. You told me that I helped you become clear about what love is. But thanks to you, my thoughts on fear have become vague." JH: "I cherish you very much." I have to confess this scene is really special to me. I tried livestreaming the show for a bit the first time for this ep and this was the scene it opened on. Initially I was like- oh SH and JH are hugging it out and then slowly, so quietly, she said "saranghaeyo". I don't know a lick of Korean, so the depth of the scene based on the dialog was lost on me, until she said that word. Of course now actually seeing it translated, the moment is tender, intimate, and everything I had hoped for. This show really has a way of making the milestone moments quiet and hopeful. I loved the silence in her office. The focus on the clock with Havana time. Even the way she said it- I see her as a bit reticent, holding just a little back, because it holds a lot of meaning to her, a bit like me. So that quiet confession and what it meant for their relationship, especially JH's confidence- was perfect for me. I'll never be able to escape your charms. " Boy u were in trouble the moment your eyes met in Cuba! Coming back to the scene, I was already spoiled by reading the forums but still nothing could've prepared me for it. I've been destroyed by sheer decency- just two, honest people deciding to bank on their love and faith for each other. So much has been said already about this scene and I can only vigorously agree. Triumphant! These two episodes dealt with their inner doubts and uncertainty. But those are conquered, and now they face their challenges together. And I want to see nothing more than Soo Hyun and Jin Hyuk's family enjoy a warm meal on that table. Really. Also, I've seen the truck of doom in many dramas. But this is first time I'm seeing the truck of love. Mijin pls get in, youre missing out. Chingus, it's so hard to restrict myself to just a few lines or pictures- 1 hour of viewing easily becomes 3 because there is so much detail to unpack in these episodes. I love this show so much, and love your posts as well. This is the last part of the Spanish letter of JH: "La verdadera intencion de la presidenta de Dong -Hwa era preservar el jardin tal como usted lo hubiera querido".. The letter emphasized that is a female CEO. It is just not clearly stated in the VO since it will be read in the letter. Samuel clearly knows that the woman he loves and the CEO is one person only. Samuel hinted it since he was in love with his wife all his life and JH is in love with the woman stated in VO and the presidenta in the letter. It takes one to know one. Hope this help. thanks for the insight. Must be one of those things that get lost in translation! Thant’s why we need the multilingual power of Soompi to get us through! As we knew that KJH asked his dad to root for his love while CSH asked KJH's dad to watch them. I thought what Teacher Lee asked will allow KJH's dad to have more opportunity to watch KJH&CSH by himself whether KJH's dad will root for KJH's love or wanna stop. Teacher Lee might not lead any decision/influence to KJH's dad and family. As CSH mentioned that she understood KJH's dad why he worries. Teacher Lee worries too, she asked KJH after she knew CSH is CEO of Donghwa who is in the strong limelight as a celebrity, KJH answered he was ready to take risk. Teacher Lee, as KJH's dad's friend's wife, she can not involve much to KJH's but KJH's dad can decide which way he would act. If all audiences were in Korea, there would be much more demand than the current hot status. @luvhollandlopPark Bo Gum from rookie to male leads, he always show how seriously he is an professional actor. Encounter is very surprising with another level from the hard-to-believe chemistry with Song Hye Kyo. Kudo to both Park Bo Gum and Song Hye Kyo more and more when the Encounter's KJH&CSH passed thick and thin...melodrama male lead and femal lead in PD&Scriptwriter&Casts&Crews's dream indeed. CSH decided like a normal girlfriend try to do for her boyfriend and his family. @stroppyse Your reason sounds very reasonable. Thank you for sharing. @nmgzlz KJH might try to reduce another tough factor for CSH by telling about cancelling Teacher Lee's meal. Let CSH decide with less a pressured factor during war with such Chaebol is KJH's way to express his love. KJH&CSH's pre-relationship(some) has been simply converted to the relationship when they had a dinner and KJH informed that he ensured his feeling and be ready to be in relationship and CSH did not object but discussing activities KSH&CSH wanna do together. Plus, when KJH ran to CSH's house and CSH mentioned what he did is a boyfriend's. CSH told Mr.Nam to leave car for her to go dating on KJH's farewell to Sokcho. Totally agreed. If this female CEO was not in KJH's mind, he could write letter with just mentioning Donghwa Hotel. For Garden Owner who dearly loves and mentions his wife whenever he can, he could catch KJH's unintentional clue because KJH has had CSH in mind all the time either till KJH was unsconcious mentioning CSH in the letter. Playground's memory with his beloved woman and Female CEO have been synchonized to be one woman. This must be the last week of drama filming, I hope the cast gets together to watch the last episode. I get anxiety when I realize they have ONLY 4 more episodes to give this drama the ending that it deserves, it’s going to be a challenge. Still wish that TVN would extend it by a week and they should definitely do a special episode to explain all the artwork. Not including the conclusion of JH and SH’s relationship there is the mysterious death of PR team manager’s brother, the crisis at Donghwa, SH’s future role at Donghwa, MIL’s revenge plot, CSH’s relationship with her mother, WS and his mother, does WS redeem himself rather can he redeem himself, does HI ever confess her feelings to JH, the relationships between LDC and Sec Jang, Driver Nam and Pr team leader, HI and KJM. So back to the love letter. As we can see, his focus was more on the love letter... I guess, the poet buried the love letter by the metasequoia tree in order to be sure that his love was protected. We see here some parallels between the garden in Cuba and the metasequoia tree. That kind of tree can become very old and they live much longer than humans, they live for centuries. If the letter is delivered to the woman he loves, the woman might either keep it or destroy it. Even if she keeps it, after her death people around her might decide to throw it away. So in my opinion, the poet wanted to ensure that the existence of his love would remain very long... like an eternity. But in the same scene, we have JH promising to CSH that until he will be by her side. And this is important because here we see again that JH is a wise and realistic person. He knows that death is part of life and they are not living in a fairy tale. But for him, death doesn't mean the end of the love story, while in the fairy tale it is the exact opposite. In fairy tales, it is often written they lived happily ever after. So death has a negative aspect. I have always written that the writer is using references from fairy tales in order to demystify them. Prince charming here is not charming at all, he is the opposite. To conclude, this drama is about the love story between JH and CSH and in my opinion, it might not end with the marriage. Now, this comment below was written many weeks ago and back then, I had discovered something important. In this post, I had come to the conclusion that the viewers are actually watching a photo album of our OTP , their love story. This is important because these photos and scenes shot in such a way will represent the memories of their love, like the love letter of the poet that was mentioned above. When you watch the introduction of this drama (the music, the visuals), you have the impression to watch an old movie, a classic. So I have the impression that the true intention of the writer and the director is to show their love story in the past, although it is not revealed yet. Why? Because the time doesn't already correspond to our actual timeline. During the episode 11, we see that JH offers the rings on February 16th but the viewers are still in January 2019. So in my opinion, the final ending could be that we see their photo album together after their marriage aso... and the marriage can not be the ending of the story. We might see them getting older. Okay, this is just a speculation from me, yet I doubt that the ending will just end with a proposal. I sense, we might see for a few minutes more... their love story doesn't end with their deaths, the photo album will be the proof that their love still exists. Maybe the writer might use the garden in Cuba as illustration for that. Furthermore I also believe that JH is different from the poet of that book. He didn't confess his love because he was terminally ill. However, for JH death is a part of life hence terminally ill or not, he would confess anyway. He did it many times: in Cuba and in this beautiful alley. Oh my, I just get sad when I read this. My tears just flowed. OMG. What just happened to me? For the first time in forever, I am thankful for the lack of BTS released with a drama. This way we would always see the actors as their respective character, not as themselves. It's sad to think Encounter is nearly over. But in the same scene, we have JH promising to CSH that untilhe will be by her side. And this is important because here we see again that JH is a wise and realistic person. He knows that death is part of life and they are not living in a fairy tale. But for him, death doesn't mean the end of the love story, while in the fairy tale it is the exact opposite. Your comment reminded me new chapter in my mind. I don't like sad story, melodrama, social gap love but Encounter made me change my mind from "No Intention to Watch" to "Addicted to Watch"
because once we think about such love, doing with uttermost is in memory, rather than doing nothing to gain nothing. At least KJH&CSH know what true love is and they have done the best to treasure their love every minute they have such chances, no reget for KJH&CSH. @Far^awayI agreed with you even I wanna watch BTS as much as possible but showing too many BTS might ruin fantasy of characters. When I have watched Encounter&rerun, I recently think if I were KJH's parents, what would I think when this son falls in love with a woman as CSH? - CSH is CEO in their son's hotel who divorced from a powerful chaebol's family which still showed strong intention to control CSH. - CSH is a reputable politician's daugther who is a candidate to be President. Could we imagine how a fruit store's parents worry their son who is in love with this Korean Candidate to President's position? - KJH has been relocated to Sokcho which is a mysterous evidence that KJH's love with CSH impacted KJH's life and would there be any more impacts to KJH's life in the future? - KJH looks dearly love CSH but KJH's parents has not known what CSH actually is. If we were CSH's dad (let me ignore CSH's mom), what would we think about CSH's love life? - To achieve such political ideology, as a politician, he requires image, power, wealth, as same as the election in several coutries in the world. In reality, if this is not in the K-drama's script, what would CSH's dad do to CSH's love life before his election? we have KJH who explained what love is and what is KJH's love value VS. Ex-husband's perspective. KJH's dad and CSH discussed with wise approach. Too special or insufficent, Too normal or adequate? KJH's dad has not decided yet while CSH asked him to watch KJS&CSH then. KJH's mom who cares about living, cooking, her husband&her sons. KJH's dad who cares about working for his family and how to take care them. When KJH values his parents so much, CSH's try to express her "normality" by attending KJH's family dinner might be her way to show her love to KJH. @NongpeeP I agree with you. In Encounter, the process of love matters the most: the little steps how they come closer and finally admit their love for each other, while for JWS, only the result matters. 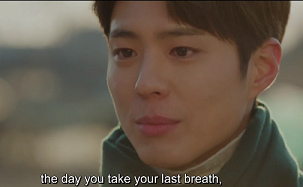 He even said it to director Choi. That's his way of thinking: that's why he faked the cheating, he lied to her aso. He wanted to start over and never paid attention to the way how he proceeded. This also explains why he uses the hotel as a way to come closer to her: only the result matters. He is closer to her physically but in reality, he is getting further away from her. He is pushing her to the other side. Was catching ep 1 for the umpteenth time and the cinematography never fails to amaze me...it's so beautiful and even more breathtaking with our lead couple and the rich sunset colors. In particular, the conversation between KJH and the garden owner caught my attention. KJH : "This Garden seems to have been loved by someone a long time ago". Owner : "It was a beautiful time. All that was here". 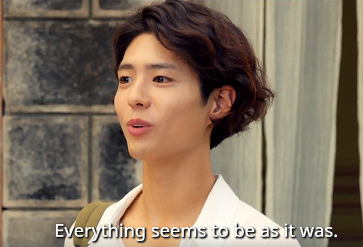 KJH : "Everything seems to be as it was". Owner : "It was so hard to keep it intact. It was the Garden of my wife. The love began here and was completed here"
Donghwa Hotel is acquiring that land to build a hotel, while keeping the beautiful garden intact. CSH had said it's important to keep the garden so people could value the passage of time (something to that effect). A strange thought struck me while looking at this scene - would it be probable that the Garden owner was narrating his own story through the eyes of KJH and CSH? Their love is so sweet and beautiful, just like the old man and his wife cos obviously he loved his wife a lot to keep the garden intact. The Garden is a symbol of love and time - signifying the journey that the owners have gone through together and end there. If this is probable, @bebebisous33 you may be right - the drama will not end at marriage but will depict KJH and CSH as they grow old together, while their love stood still through the passage of time. "I cherish you very much". Coincidental? I just have the goosebumps.....am I crazy? I think I am, with all the beautiful and magical moments of KJH and CSH in "Boyfriend" and spoilt by the first-class cinematography too. P/S : I really want the PD to extend the episodes to at least 24. Yes, 24! More drama from the MIL and Ex-hubby but it's ok, so long as I get to feast my eyes on the magnificent visuals and chemistry of PBG and SHK! Agree! Whether the love story has a “happy ending” really depends on how the person narrating the story defines happiness and ending. JH’s views of a happy ending to a true love might be very different from what people would call happily ever after. Like you, I think the story is being narrated, most probably by one of the main leads and I am tipping in favor of JH being the narrator. I think the snapshots are indicative of memory but also remind me of those illustrations in fairy tales, especially since @stardustvoid pointed out the painting of the little prince, I can’t help but draw connections between the little prince and his rose. The little prince and his beloved rose watching the sunset remind me of JH and SH’s encounter at Malecon beach. For me the way the drama has been presented is reminiscent of a book with illustrations and if JH is the narrator, I can’t help think that the entire drama is actually him sharing his story where it’s something like The Notebook - An old JH is reciting their story, in this scenario they did get the conventional happy ending - SH has Alzheimer’s and he retells their story to her to remind her of their shared memories and the pictures are the illustrations of their story or she has passed away and JH - just like the old widow teacher and Samuel is sharing his love story with someone young who is also in love. I don’t know why but I think that if one of them passes away then the other will too. Even the first time they met, they cheated death together - a car crash which could have resulted in his death and SH almost falling down in her drugged state.